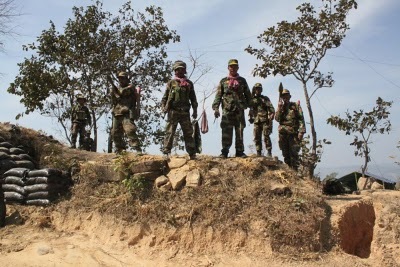 Cambodian troops emerged from bunkers after fighting on 4th February. Cambodian commanders have told on Wednesday 26th February warned Thai troops that Cambodian troops will retaliate if Thai troops do not stop attacking Cambodian troops based at Preah vihear areas. artillery shells and machine guns into Cambodian territory from 5 pm. the tree and bounced back, exploded and injured many Thai troops. In an interview with Mr. Yun Samean of RFA, the Cambodian soldier denied all Thai charges. Yun Samean: The Thai media reported that Cambodian troops crossed into Thai territory to cut barbed wires. soldiers) stay calm so we all can do business together. Samean: The Thai side was shooting or the Cambodian side was shooting? didn’t respond. The general situations have eased now.